Hi! My name is Rocky Lam. I am currently working at an international school in Hong Kong, teaching Year 2, or Grade 1. (We run a British adapted curriculum, but I am certified in Alberta and Ontario.) This will be my fourth year teaching and my very first MET course. I grew up in Hong Kong when I was little, and immigrated to Toronto, Canada since the age of 9. I completed both of my undergraduate degrees at Queen’s University, and subsequently obtained my Specialist in English Language Learning. I am interested in all facets of technology. At my last school in Macau, I was lucky enough to be integrated with so much technology in the classroom, Macbooks, iPads and SMARTBoards, to explore new ways that promote learning. With this abundance of technology, I sometimes find it confusing to navigate and being in control. There are so much that children know that I learn from everyday. 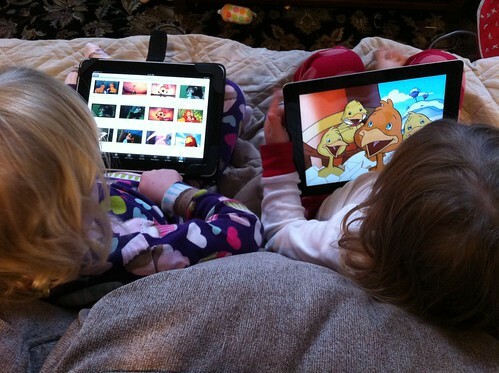 One of the reasons why I chose this particular image because it contrasts so much from what I remember from childhood, in which technology has become such a necessity that even toddlers gain regular access to them. Watching videos, playing interactive games, or taking pictures with the camera with anything that starts with i- (iPod, iPhone, iPad). In many ways, these activities engage and stimulate children and provide them with the tools of this new technological era. However, I think about how much more we rely on these devices and its significance to student learning. But, that raises many issues: how much time is too much time spent? How much does technology raise student achievement? Can we measure student learning through teaching through these devices? But don’t get me wrong, I love technology, where my iPad device simplifies my life, with email, Facebook and everything nice. At the same time, I keep thinking about when I forgot to charge my iPad overnight. What did I have the next day? A rectangular black mirror. This entry was posted in Uncategorized and tagged Introductions, iPad, technology. Bookmark the permalink. Like you and many others in this program, I have a love technology, especially of the i- variety, but also like you, have some doubts about these devices as educational tools. My first, and so far only, experience with iPads in the classroom comes from the last day I subbed, in a grade 6/7 class. The teacher had left the sixes with an open-ended research project, looking up information on the web to design an anti-drug poster, and allowed them to use the school’s iPads (while she took the grade sevens out for an end-of-the-year kayak trip). Left alone with these impressive machines, I was surprised to find the students only wanted to find info from conventional Internet sources (government PSA and Google searches) and they rarely clicked on links easily found at the bottom of Wikipedia entries. I was not so surprised to find this minimal effort allowed them more time to play Mine Craft with their classmates. Of course, it might have been a different story, perhaps a bit more educational even, if the students were asked to create an on-line presentation (or even their own PSA in the Mine Craft virtual world) rather than a pencil-and-paper poster, but I’ll chalk this up as a learning moment for me, and hopefully a more engaging teaching moment for the next time I am in a classroom with iPads. What school are you at in Hong Kong? My kids attended CDNIS and I worked there for awhile. Ahh! That’s very cool, Joy! Where are you working now? I am at Yew Chung International School.